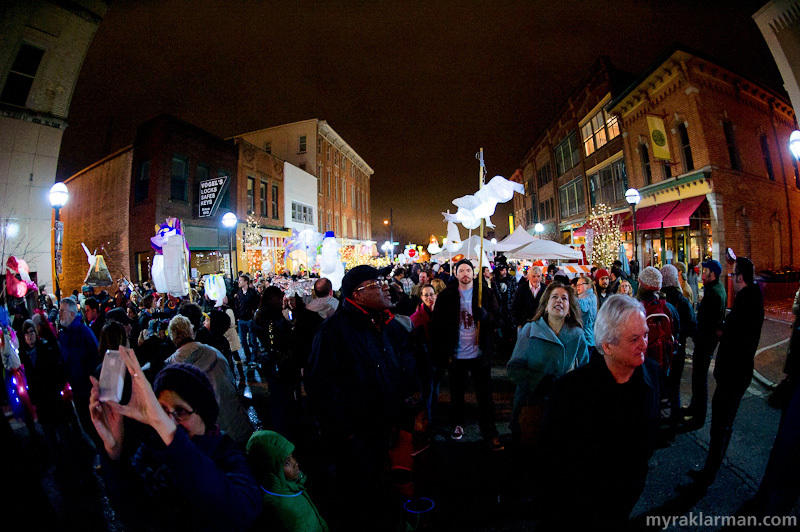 The weather wasn’t nearly as warm as last year’s inaugural FoolMoon, but we were all thanking our lucky stars that it was at least dry. Precipitation, of any variety, may not have dampened the spirits of the most FoolHardy, but I fear it would have kept a lot of the young families away. 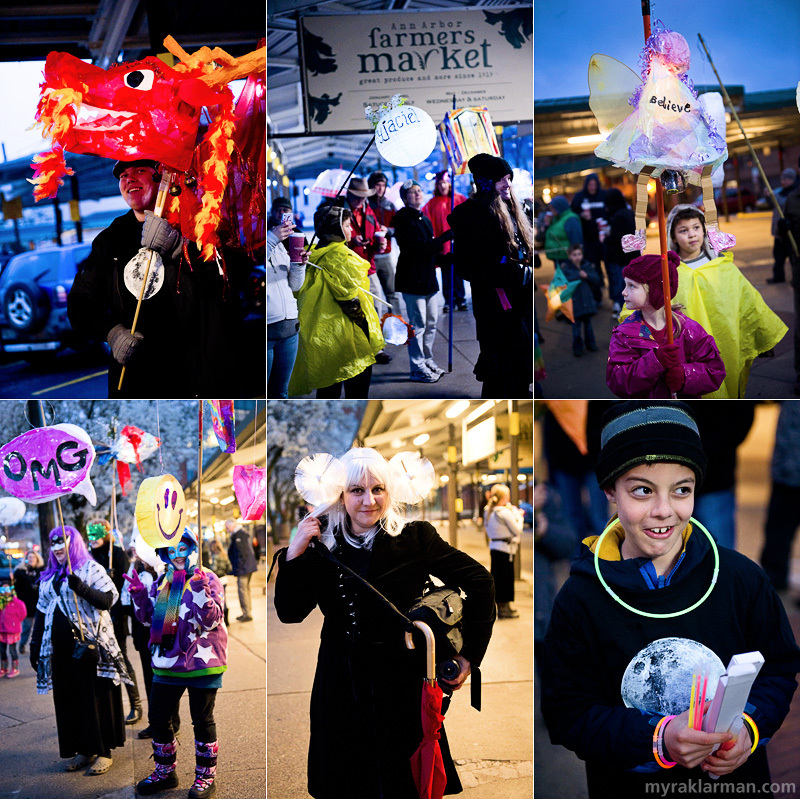 At the Farmers’ Market constellation station in Kerrytown, we witnessed clusters of families and groups of friends gathering and gathering and gathering — until, at some point, the assembled Fools formed a bonafide crowd! Once the procession to downtown got started, we promptly lost Max to the front of the line. This happened last year, too, and we knew not to worry about it. Like last year, we had instructed friends not to buy Max any food whatsoever. If Max wanted something to eat, he would have to return to us. This strategy worked faster than expected, thanks to Bryant Stuckey’s irresistible candy-man-like get-up — Max met us right at the corner of Main and Washington, to hard-sell us one of Bryant’s Fool Moon Pies. The procession wends its way around Kerrytown before finally descending upon downtown. 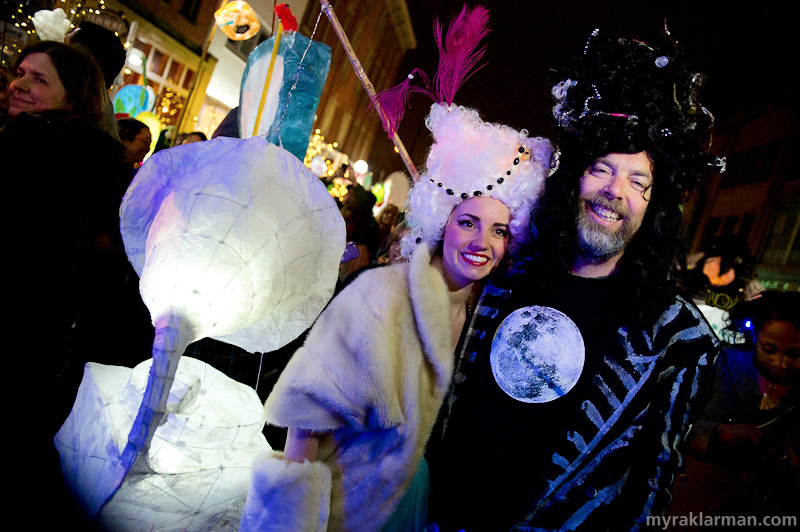 FoolMoon luminary spokesmodel Meryl Waldo and FestiFools founder Mark Tucker greet all the revelers as they arrive to Washington Street. Dig that Victrola (conventional, late–twentieth century turntables may suffice for your typical hipster, but Meryl parties like it’s 1903). It warmed my heart to see so many brave the cold temperatures. 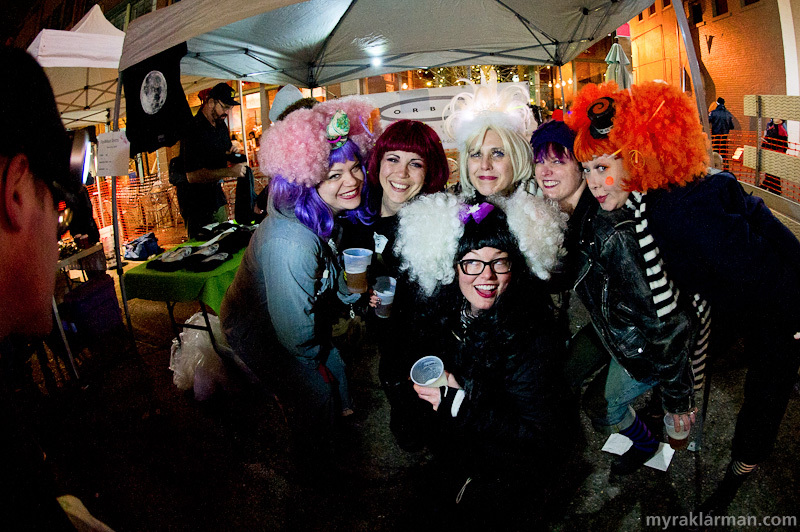 Everyone at FoolMoon 2012: you’re the best! 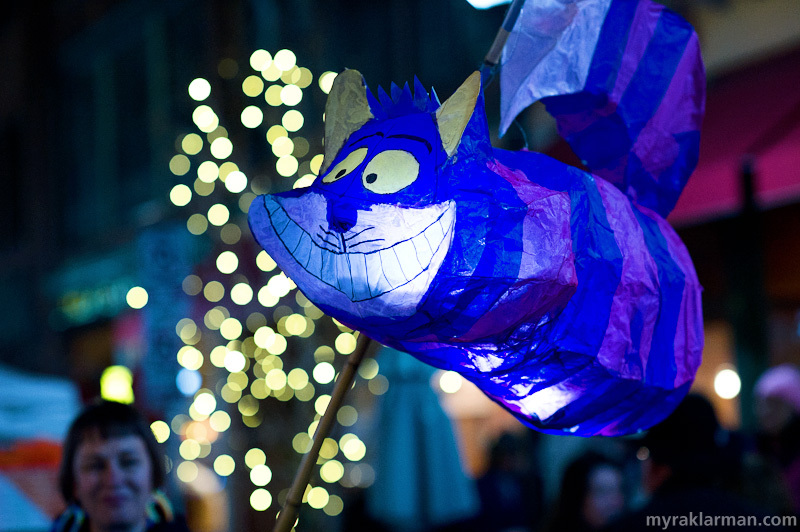 Who doesn’t love the Cheshire Cat? 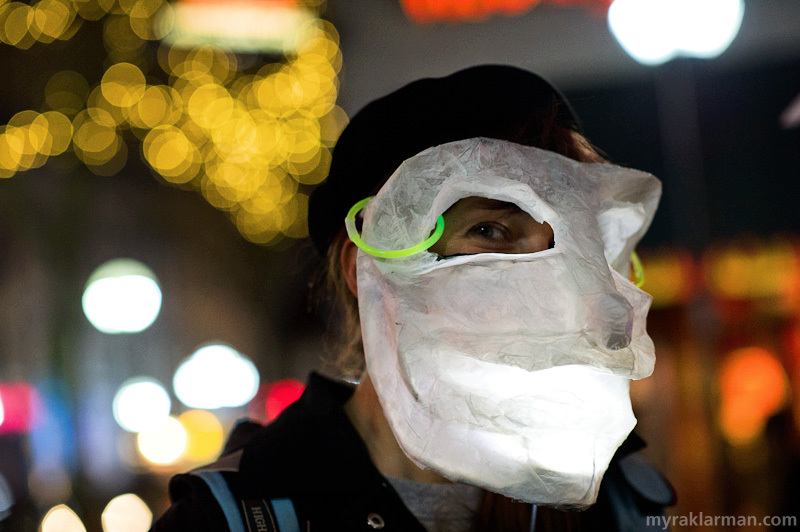 Luminary as mask — or is it mask as luminary? Either way, it’s very good. 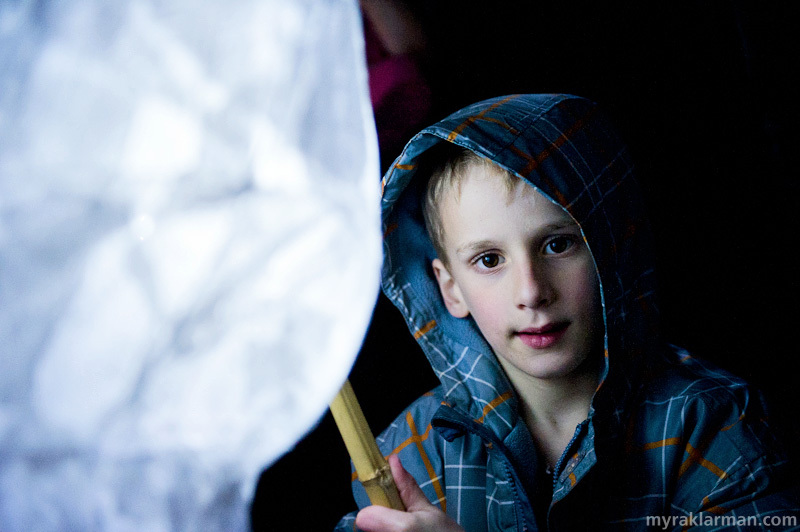 This young man is beautifully lit by his own luminary (which happened to be a giant light bulb). 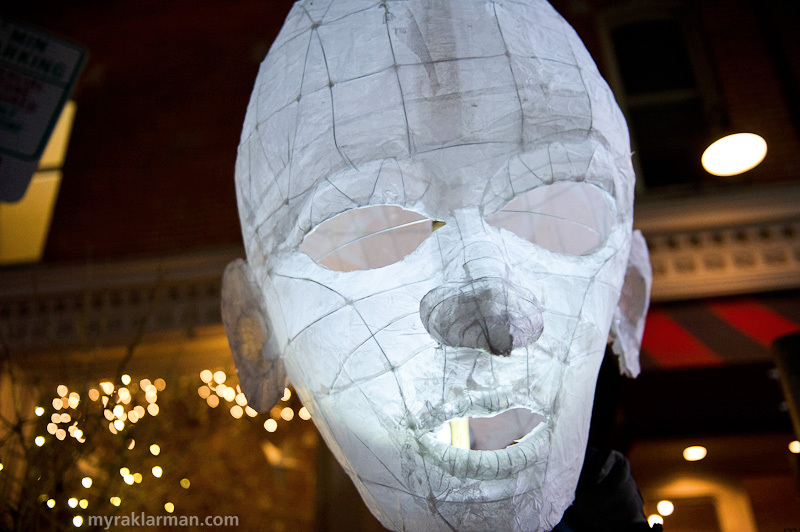 One of artist Gretchen Adracie's gorgeous luminaries. Some of the best seats for watching the event were in Frita Batidos’ fishbowl. Fernando Yarza’s homage to the Coneheads? 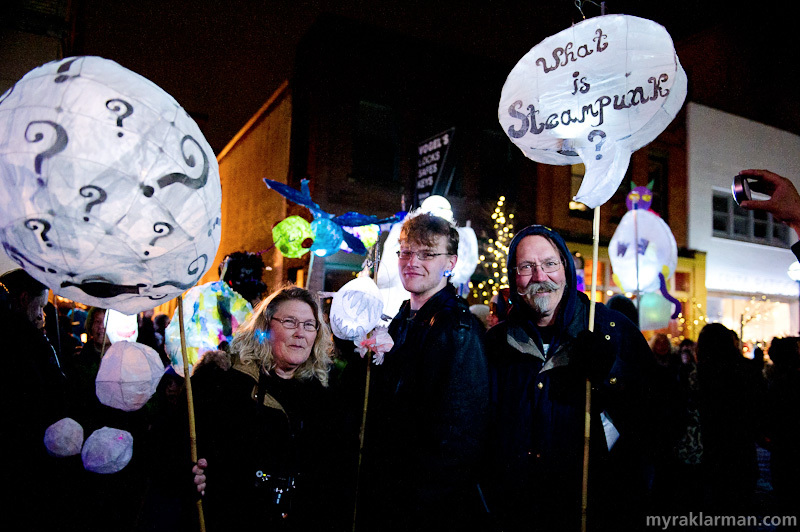 | FestiFools steering committee member Gretchen Adracie was the brains (and brawn) behind the gigantic, full-moon luminary sculpture. 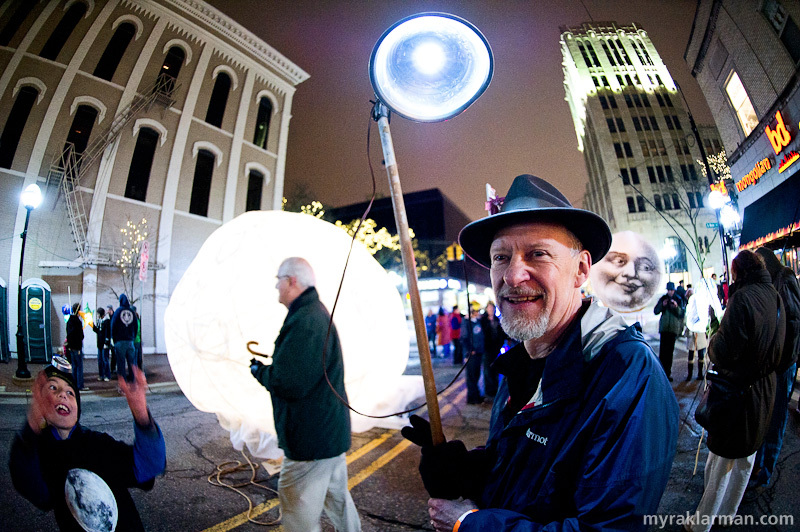 | FoolMoon über-fan Rick Cronn is a man of many heads. | My boys flashing big grins and headlamps. 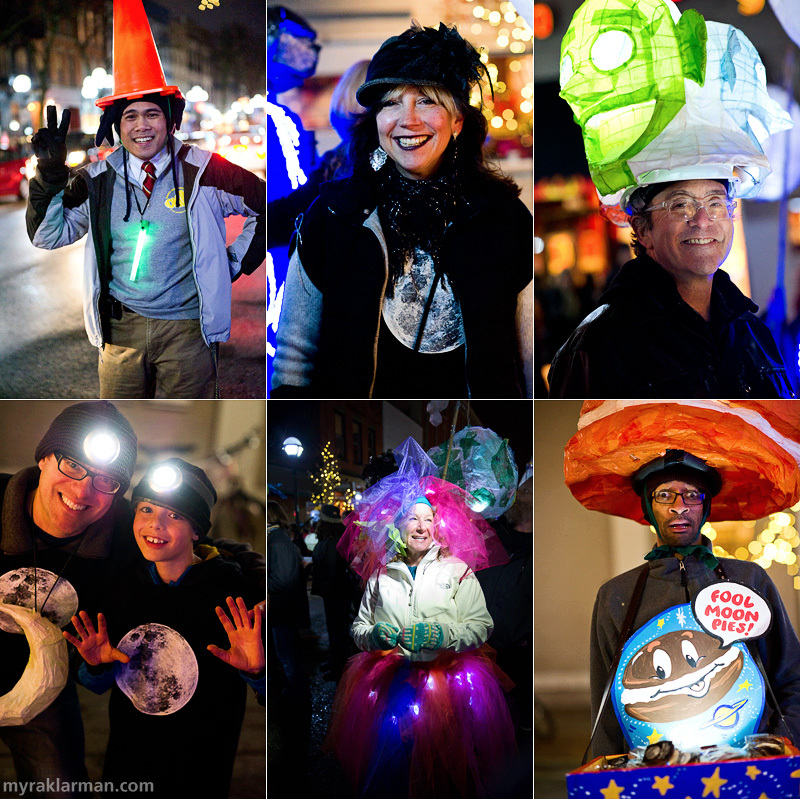 | FestiFools steering committee member Jeri Rosenberg looking absolutely resplendent in the latest illuminated fashions. | Confectionery genius Bryant Stuckey (of Decadent Delight) really embraced the spirit of the event, donating 300 of his specially created “Fool Moon Pies” to the cause. And let me tell you, not only did he raise a bunch of cash to support all this Foolishness, but those pies were to die for. The Orbit crew played the Fools even though their luminous hairdo-ings were postponed till Sunday’s street party. There’s something quite surreal about this image. Joel Swanson is plugged in (“into,” actually) and turned on. Max is all aglow, apparently experiencing some sort of religious ecstasy. And there are, like, so many moons! Bonus: Can you spot the Hitchcock cameo (the great director strolling through the frame with his umbrella tucked under his arm)?